Sustainable use provisions under article 10(c) of the Convention on Biological Diversity (CBD) require States Parties to …” protect and encourage customary use of biological resources in accordance with traditional cultural practices that are compatible with conservation and sustainable use requirements.” Through the adoption of the CBD’s Principles and Guidelines for the Sustainable Use of Biodiversity, government signatories to the Convention have agreed that sustainable use of biodiversity is enhanced by supportive policies, laws and institutions at all levels of governance (Principle 1), and that indigenous and local communities should be empowered to manage biological resources and their “rights” over and/or “stewardship” of biological resources should be recognised and reinforced (Principle 2). 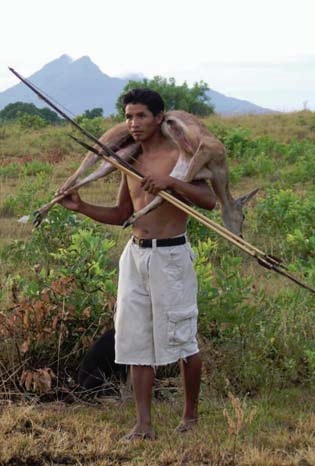 This study summarises how the Wapichan people in Guyana (South America) customarily use biological resources within their traditional territory in the South Rupununi, and explores the opportunities and challenges relating to effective implementation of article 10(c) of the CBD at the local and national level. The study is based on 4 month’s fieldwork undertaken by a team of eight Wapichan researchers in 16 villages and numerous smaller settlements in the South Rupununi District. The results of the study and its recommendations were validated by the leaders and elders of all participating communities in November 2005. It is highlighted that the Wapichan people have occupied and used land and biological resources in the South Rupununi since time immemorial. Wapichan communities feel a strong attachment to this extensive area, which constitutes their ancestral wiizi “territory.” A large seasonally flooded grassland-shrub ecosystem in the western and central parts of the territory and an extensive tropical forest ecosystem in the south and east, together support a rich mosaic of habitats and a high biodiversity. The whole area is drained by major and minor rivers associated with permanent and seasonal wetlands that support a large variety of fish and other aquatic life, including the endangered giant otter and arapaima fish, among others. Indigenous authors point out that present day use of resources can be partly viewed as adaptation of custom in response to economic, cultural and institutional change introduced since colonial times. A significant number of families, for example, have integrated small-scale cattle rearing on the savannah into their livelihood, while maintaining their traditional farms cut in forest and savannah woodland. Central villages have become larger and more permanent since the introduction of schools and churches, but Wapichan communities have adapted their settlement pattern in order to maintain their traditional practice of shifting cultivation. Documentation of the use of biological resources shows that Wapichan communities in Guyana customarily use the land for farming and use a wide variety of uncultivated plants and wild animals for food, craft, construction, medicines and cultural activities. Customary use takes place across the whole range of ecosystems and habitats found in the South Rupununi: savannah, forest, mountains, swamps, lakes, rivers etc. Settlement is dispersed, with families occupying at least three separate dwellings: one in the main village, one on the family farming grounds and another in distant hunting and fishing grounds. Family farmlands lie between 1 and 25 miles from settlements, while shared community hunting, fishing and gathering grounds are located between three and 35 miles from people’s homes. The customary land use system is thus an extensive one.